Foundation project: This research was supported by Basic Science Research Program through the National Research Foundation of Korea (NRF) funded by the Ministry of Science, ICT and Future Planning (NRF-2017R1A2B4005915). Stachys sieboldii (S. sieboldii) Miq. is a herbaceous plant in the family Labiatae and is widely used as a vegetable in China, Japan, and Korea. Additionally, S. sieboldii Miq. has also been used as a Chinese folk medicine to treat ischemic brain injury, dementia, and various gastrointestinal related diseases. S. sieboldii Miq. contains various oligosaccharides, which could stimulate the growth of beneficial microorganisms in the human intestine and is considered as a wellness-promoting food in Asian countries. S. sieboldii Miq. has been reported to contain several active compounds including terpenes, flavonoids, and phenolic compounds, which are highly associated with its antimicrobial, antioxidant,,,,, and antitumor properties. Free radicals are oxygen-containing molecules with one or more unpaired electrons, making them highly reactive towards other molecules. In most macromolecules, oxidative stress damage is induced by free radicals. Therefore, oxidative stress is considered as a critical pathophysiological mechanism in different courses and processes of diseases, including cardiovascular diseases, cancer, diabetes, rheumatoid arthritis, and various neurological disorders. Antioxidants are used for reducing agents, and attenuating oxidative damage to critical biological structures by protecting them from free radicals. Antioxidants are found in many kinds of food, and several studies have recommended that continuous intake of vegetables and fruits in one’ diet leads to a positive regulation against oxidative stress induced damage in the body. Our previous studies presented that acetone+methylene chloride extract from S. sieboldii Miq. had higher levels of flavonoids than the methanol extract[ 12], which was associated with a higher free radical scavenging activity. In this present study, we investigated the effect of extracts and fractions from S. sieboldii Miq. on cellular reactive oxygen species and glutathione production and genomic DNA oxidation to determine its potential use as a natural antioxidant supplement. Dulbeco's modified Eagle's medium, fetal bovine serum, phosphate buffered saline (PBS), dimethylsulfoxide, penicilline-strectomycin, and 2’-7’ dichlorofluorescein-diacetate (DCFH-DA) were purchased from Sigma-Aldrich (St. Louis, MO). A human fibroblast cell line HT-1080 was acquired from the Korea Cell Line Bank. The cells were maintained at 37 °C in 5% CO2 in Dulbeco's modified Eagle's medium with 10% fetal bovine serum and 100 units/mL penicillin-streptomycin. S. Sieboldii Miq. was purchased from the Misan herb farm (Daegu, Korea). Dried S. Sieboldii Miq. (3 kg) was extracted with acetone/ methylene chloride (A+M, 0.6 g) and methanol (MeOH, 12.9 g) to obtain the maximum amount of extracts. Then the combined crude extracts (6.8 g) were fractioned with n-hexane (0.82 g) and 85% aqueous MeOH (1.82 g), and the aqueous layer was also further fractioned with n-butanol (n-BuOH, 1.38 g) and water (2.0 g), resulting in the n-hexane, 85% aqueous MeOH, n-BuOH and water fractions. All extracts and fractions were vacuum dried at 40 °C using rotary vacuum evaporator (N-100, EYELA, Japan) and the residue was kept at 4 °C until further analysis. For the test samples all extracts and fractions were dissolved in dimethylsulfoxide at various concentrations. Cellular oxidative stress due to ROS generation from H2O2 was measured using the DCFH-DA method. HT-1080 cells were planted in 96-well plates (5 × 105/well) for 24 h. After rinsing with PBS, 20 μM DCFH-DA was treated and pre-incubated for 20 min. Then the test samples were added and set for 1 h. After the DCFH-DA was removed and rinsed with PBS, 500 μM H2O2 were added and set for 120 min. The control was treated with H2O2 and distilled water and blank was treated with distilled water without H2O2. Dichlorofluorescein fluorescence was assessed at 485 nm and at 535 nm by a fluorometric plate reader (VICTRO3, Perkin Elmer, Wellesley, MA). GSH levels were measured using a fluorescent method with mBBr. HT-1080 cells were planted in 96-well plates (5 × 105/well) for 24 h. The cells were treated with samples at various concentrations and incubated for 30 min. After rinsing with PBS, 40 μM mBBr was added and incubated for 30 min. The fluorescence was assessed at 360 nm and at 465 nm by the fluorometric plate reader (VICTRO3, Perkin Elmer, Wellesley, MA). High molecular weight genomic DNA was separated from the HT-1080 cells through standard phenol/proteinase K procedure. Concisely, cultured cells were rinsed with PBS and aliquoted into 1 mL of PBS with 10 mM EDTA. After centrifugation the cells were mixed in RNase (0.03 mg/mL), NaOAc (0.175 M), proteinase K (0.25 mg/mL) and sodium dodecyl sulfate (0.6%). The mixture was set for 30 min at 37 °C and 1 h at 55 °C. Then, phenol:chloroform:isoamyla lcohol (25:24:1) was diluted at 1:1 ratio and mixture was centrifuged at 6 000 rpm for 5 min at gg4 °C. The upper was blended with 100% ice cold ethanol at a 1:1.5 ratio and set for 15 min at -20 °C. After centrifugation at 16 000 rpm for 5 min at 4 °C , the lower pellet was stirred in tris-ethylenediaminetetraacetic acid buffer and the purity of DNA was measured at 260/280 nm. H2O2 induced DNA oxidation was assessed according to Kang's method. Concisely, 100 μL of DNA reaction mixture was prepared by adding a pre-determined concentrations of the sample, a 200 μM final concentration of FeSO4, a 2 mM final concentration of H2O2 and a 50 μg/mL of genomic DNA. Then, the mixture was set at room temperature for 30 min and the reaction was withdrawn by adding 10 mM EDTA. Aliquots (20 μL) of the reaction mixture containing about 1 μg of DNA were electrophoresed on a 1% agarose gel for 30 min at 100 V. After staining with 1 mg/mL ethidium bromide, the gels were imaged through UV light by AlphaEase® gel image analysis software (Alpha Innotech, CA, USA). The control was treated with H2O2 and distilled water and blank was treated with distilled water without H2O2. Data were presented as a mean ± standard deviation (SD). The significance of differences observed between the control and experiment groups used the standard Student's t test at P<0.05. Analyses were conducted using the STATISTICA package (TopCo, Palo Alto, CA, USA). [Figure 1] shows the inhibitory effects of the solvent fractions (n-hexane, 85% aqueous MeOH, n-BuOH and water) of S. sieboldii Miq. on ROS production induced by H2O2 in HT-1080 cells. All tested fractions decreased H2O2 induced ROS production in a concentration-dependent manner. 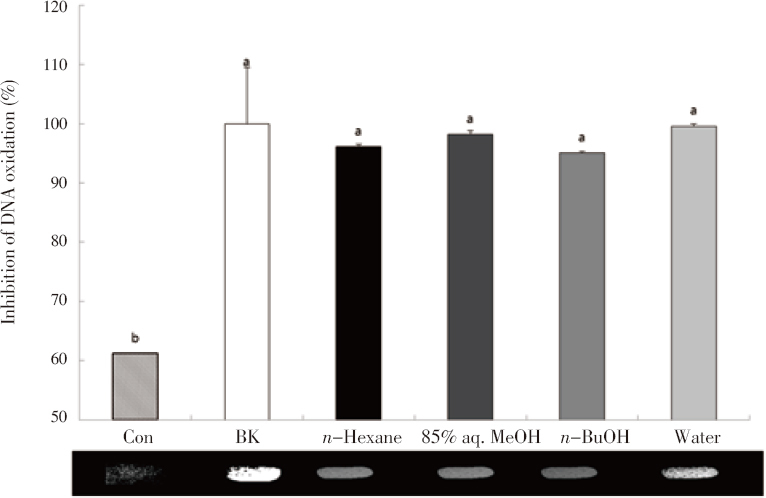 Adding with n-hexane, 85% aqueous MeOH and n-BuOH fractions (0.05 mg/mL concentration) resulted in 63%, 35%, and 45% ROS inhibition, respectively. 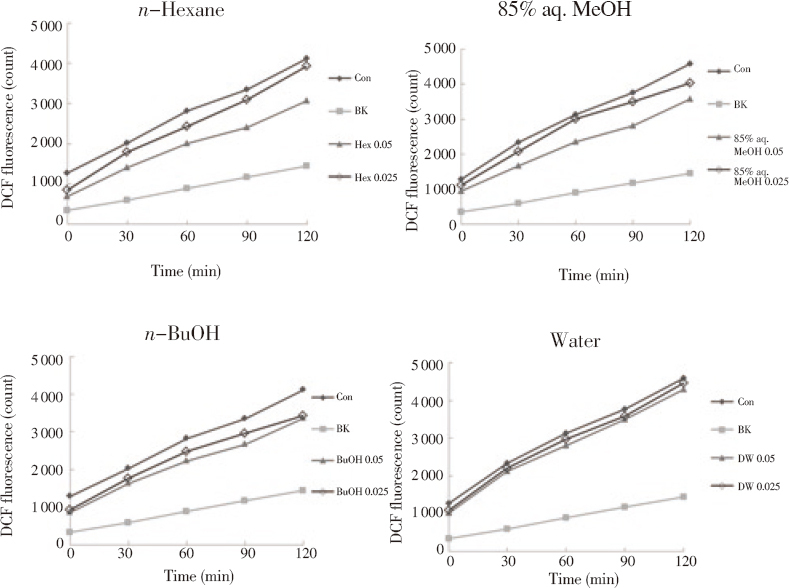 These results suggested that the n-hexane fraction had the strongest effect on reducing H2O2-induced ROS production. Figure 1: Effect of fractions from S. sieboldii Miq. on the amounts of ROS in HT-1080 cells. Control-treated with H2O2 and distilled water; Blank-treated with distilled water without H2O2 solvent; n-Hexane: n-hexane fraction; 85% aq. MeOH: 85% aqueous methanol fraction; n-BuOH: n-butanol fraction; Water: water fraction. Total GSH levels were determined on the lysates of HT-1080 cells treated with A+M and MeOH extracts from S. sieboldii Miq. at various concentrations [Figure 2]. 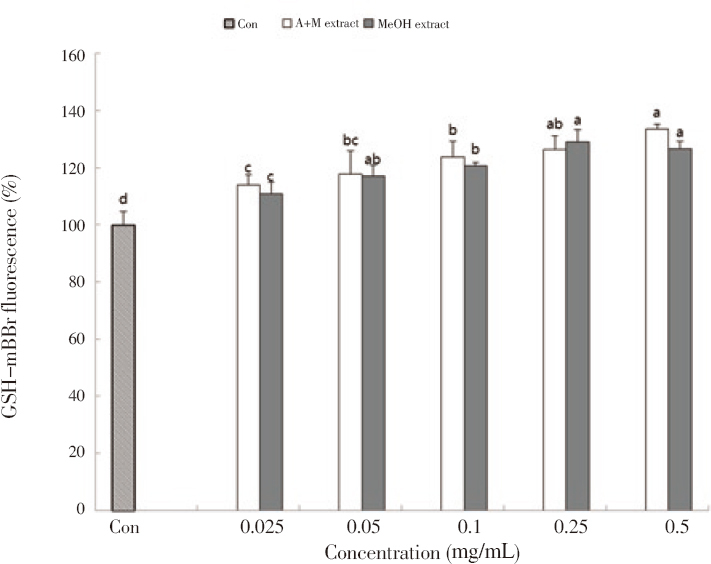 Supplementation of cells with A+M and MeOH extracts significantly increased total GSH levels relative to that in the control experiment (P<0.05). [Figure 3] presents the effects of S. sieboldii Miq. fractioned in various solvents on GSH levels. Four fractions significantly increased GSH levels at a low concentration (0.025 mg/mL) (P<0.05). Among these fractions, the n-hexane fraction showed greater levels of GSH. Figure 2: Effect of acetone+methylene chloride (A+M) and methanol (MeOH) extracts from S. sieboldii Miq. on the contents of GSH in HT-1080 cells. a-dDifferent superscripts indicate significant differences at P<0.05. Figure 3: Effect of fractions from S. sieboldii Miq. on the contents of GSH in HT-1080 cells. Solvent: n-Hexane: n-hexane fraction; 85% aq. MeOH: 85% aqueous methanol fraction; n-BuOH: n-butanol fraction; Water: water fraction. a-dDifferent superscripts indicate significant differences at P<0.05. The ability of extracts and fractions from S. sieboldii Miq. to inhibit DNA oxidative damage was assessed using genomic DNA isolated from HT-1080 cells. [Figure 4] and [Figure 5] present the inhibition rate (%) of DNA oxidation related to the blank without Fe(II)-H2O2. Both the A+M and MeOH extracts significantly inhibited Fe(II)-H2O2 induced oxidative stress DNA damage (P<0.05). All fractions including the n-hexane, 85% aqueous MeOH, n-BuOH and water fractions significantly inhibited oxidative DNA damage by > 90% (P<0.05). These results suggest that S. sieboldii Miq. extracts and fractions provide an inhibitory effect on radical-mediated DNA damage. 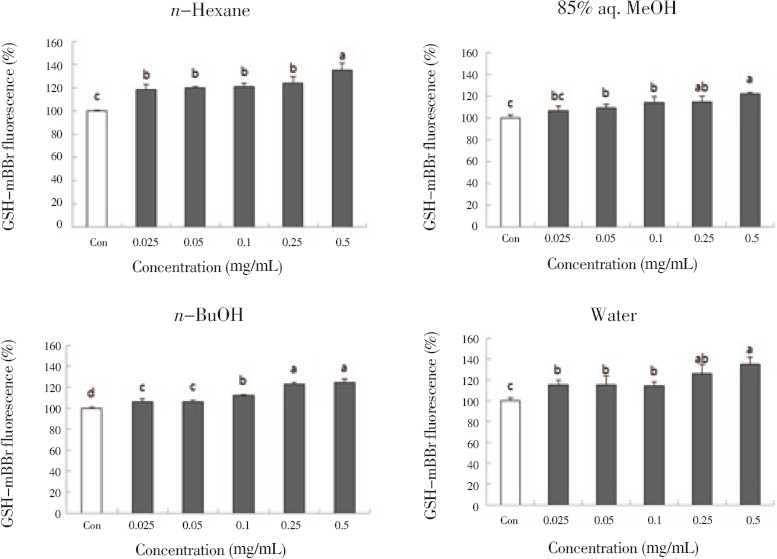 Figure 4: DNA oxidative inhibition by acetone+methylene chloride (A+M) and methanol (MeOH) extracts (0.05 mg/mL concentration) from S. sieboldii Miq. in HT-1080 cells. Control-treated with Fe(II)-H2O2 and distilled water; Blank-treated with distilled water without Fe(II)-H2O2 solvent. Values with different letters are significantly different at P<0.05 using Turkey's test. Figure 5: DNA oxidative inhibition by fractions (0.05 mg/mL concentration) from S. sieboldii Miq. in HT-1080 cells. Control-treated with Fe(II)-H2O2 and distilled water; Blank-treated with distilled water without Fe(II)-H2O2 solvent; n-Hexane: n-hexane fraction; 85% aq. MeOH: 85% aqueous methanol fraction; n-BuOH: n-butanol fraction; Water: water fraction. Values with different letters are significantly different at P<0.05 using Turkey's test. ROS have been related to a higher risk of chronic and degenerative diseases including cardiovascular and neurodegenerative diseases, and cancer. As the activity of ROS is likely inhibited by antioxidants, the damage caused by ROS attenuates presumably the risk of chronic diseases with antioxidant supplementations. Thus, consumption of vegetables and herbal plants, which are rich sources of antioxidants, could regulate biochemical pathways and prevent those chronic diseases. Antioxidants attenuate ROS stress-induced damages due to their ability to donate electrons that neutralize the radicals without forming another. In our previous study, extracts from S. sieboldii Miq contained flavonoids and showed a radical scavenging ability in DPPH and 2.2’-azino-bis(3-ethylbenzothiazoline-6-sulfonic acid) diammonium salt (ABTS) assays. The n-hexane fraction from S. sieboldii Miq was more effective for attenuating cellular ROS production among the fractions presented in this study. According to Baek et al., the ethyl acetate fraction from S. sieboldii Miq., which had higher levels of phenolic compounds, showed the strongest antioxidant radical scavenging activity among other fractions in 1,1-diphenyl-2-picryhydrazyl assay, ferric thiocyanate method and nitrite scavenging ability test. Na et al. found that S. sieboldii Miq. contained more phenolic compounds than Korean ginseng, and that it had a higher radical scavenging capacity based on DPPH, ferric reducing antioxidant potential and Trolox equivalent antioxidant ability. In addition, Feng et al. observed a high scavenging capacity towards superoxide anion, hydroxyl, and ABTS radicals but low scavenging activity towards DPPH radicals. Another study of S. sieboldii Miq. indicated that S. sieboldii Miq. powder adding white bread had the significantly scavenging effect of DPPH and ABTS radicals with increased levels of added S. sieboldii Miq. powder. Khanavi et al. compared the antioxidant activity and total phenolic contents in several Stachys species, suggesting that Stachys persica and Stachys fruticulosa had the highest phenol contents, which are associated with a higher antioxidant activity. Taken together, these results demonstrated that plants in the genus Stachys could be used to prevent numerous diseases related to oxidative stress. GSH is an important antioxidant and very likely considered a detoxification of various electrophilic compounds and peroxides catalyzed by glutathione S-transferases and glutathione peroxidases. Abdel-Sattar et al. observed that the methanolic extract from Stachys schimperi Vatke fairly protected against doxorubicin-induced damages by assessing the production of GSH and malondialdehyde. Based on our data, the n-hexane fraction increased GSH levels. These results are in the same degree with the inhibitory effects of S. sieboldii Miq. on H2O2-induced ROS production. Thus this plant species may contain certain active antioxidant compounds, such as polyunsaturated fatty acids and polyphenols. Tepe et al. compared the effect of water extracts from Teucrium polium and Stachys iberica on antioxidant, potential protection against oxidative DHA damage and antiamoebic activities. They found that the water extract from Teucrium polium had a stronger biological activity than that of Stachys iberica in all test systems. This present paper is the first study to examine the DNA damage protective ability of S. sieboldii Miq. Both A+M and MeOH extracts, as well as the four fractions from S. sieboldii Miq. did show protective effects against oxidative DNA damage induced by Fe(II). The findings of this study suggested that the n-hexane fraction from S. sieboldii Miq. decreased H2O2-induced ROS and oxidative stress-induced DNA damage and increased GSH production. Based on these results on the potential antioxidant activity and content of phenolics and flavonoids in S. sieboldii, this plant species may be rather useful as an alternative source instead of the synthetic antioxidants to delay lipid peroxidation in living organisms. However, additional studies are needed to determine the structures of the most active compounds of the plant. Basic Science Research Program of the National Research Foundation of Korea (NRF) in the Ministry of Science, ICT and Future Planning (NRF-2017R1A2B4005915) supported this research. Cho HK, Kim CS, Woo KW, Kang RL. A new triterpene saponin from tubers of Stachys sieboldii. Bull Kor Chem Soc 2014; 35(5): 1553-1555. Yin J, Yag G, Wang S, Chen Y. Purification and determination of stachyose in Chinese artichoke (Stachys sieboldii Miq.) by high-performance liquid chromatography with evaporative light scattering detection. Talanta 2006; 70(3): 208-212. Lee JE, Jin SY, Han YS. Antioxidant activities and quality characteristics of tufu supplemented with Chinese artichoke powder. Kor J Food Nutr 2014; 27(1): 10-21. Na BR, Lee JH. Antioxidative capacities Stachys sieboldii Miq. and Ginseng powders and their effects on quality characteristics of cookies. J Kor Soc Food Sci Nutr 2017; 46(1): 68-76. Ryu BH, Park BG, Song SK. Antitumor effects of the hexane extract of Stachys sieboldii MIQ. Kor J Biochem Bioeng 2002; 17(6): 520-524. Baek HS, Song SK, Na YS, Ryu BH. Antioxidant activities of Stachys sieboldii MIQ. stalks. Kor J Biotechnol Bioeng 2003; 18(4): 266-271. Jeon KS, Park SI. Antioxidative properties of Chinese artichoke (Stachys sieboldii Miq) added white bread. Kor J Culinary Res 2015; 21(6): 120-132. Ryu BH, Park BG. Antimicrobial activity of the hexane extract of Stachys sieboldii MIQ leaf. Kor J Life Soc 2002; 12(6): 803-811. Liu Z, Ren Z, Zhang J, Chuang CC, Kandaswamy E, Zhou T, et al. Role of ROS and nutritional antioxidants in human disease. Frontiers Physiol 2018; 9: 477. Doi:10.3389/fphys.2018.00477. Noorimotlagh Z, Mirzee SA, Ahmadi M, Jaafarzadeh N, Rahim F. The possible DNA damage induced by environmental organic compounds: The case of Nonylphenol. Ecotoxicol Environ Saf 2018; 158: 171-181. Doi: 10.1016/j.ecoenv.2018.04.023. Sharma GN, Gupta G, Sharma P. A comprehensive review of free radicals, antioxidants and their relationship with human ailments. Crit Rev Eukar Gene 2018; 139-154. Doi: 10.1615/CritRevEukaryotGeneExpr.1028022258. Lee JW, Lim SY. Comparison in flavonoid contents and antioxidant effect of extracts from Stachys siebolii Miq. and Lycopus lucidus Turcz. J Life Sci 2018; 28(7): 841-848. Bae JH, Jang JR, Lim SY. 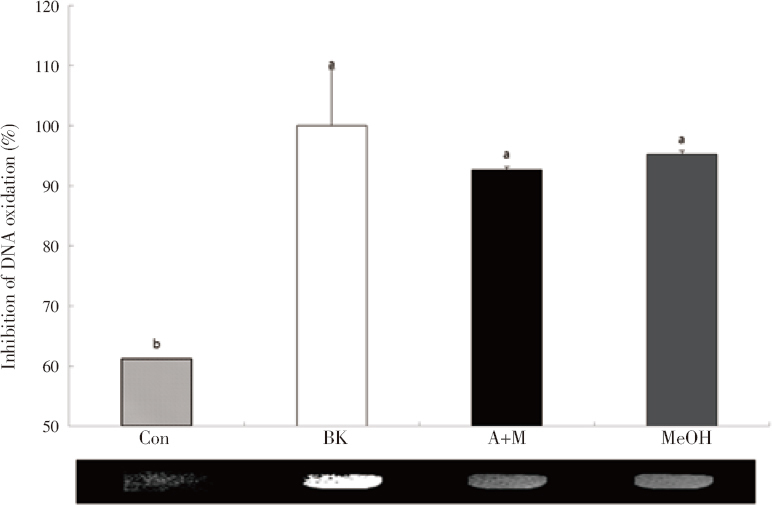 Production of glutathione and reactive oxygen species in cell line HT-1080 treated with chub mackerel (Scomber japonicas) extracts. Philipp Agric Sci 2014; 97(2): 180-184. Lebel CP, Ischiropoulos H, Bondy SC. Evaluation of the probe 2’,7’-dichlorofluorescin as an indicator of reactive oxygen species formation and oxidative stress. Chem Res Toxicol 1992; 5(2): 227-231. Poot M, Verterk A, Kosrer JF, Jongkind JF. De novo synthesis of glutathione in human fibroblasts during in vitro ageing and in some metabolic diseases as measured by a flow cytometric method. Biochem Biophys Acta 1986; 883(3): 580-584. Sambrook J, Russell DW. Molecular cloning: A laboratory manual. Third Edition. NY, USA: Cold Spring Harbor Laboratory Press; 2001. Kang JH. Oxidative damage of DNA induced by ferritin and hydrogen peroxide. Bull Kor Chem Soc 2010; 31(10): 2873-2876. Benavoli A, Corani G, Mangili F. Should we really use post-hoc tests based on mean-ranks? J Machine Learning Res 2016; 17(3): 1-10. Alkadi H. A review on free radicals and antioxidants. Infect Disord Drug Targets 2018. Doi: 10.2174/1871526518666180628124323. Liguori I, Russo G, Curcio F, Bulli G, Aran L, Della-Mrte D, et al. Oxidative stress, aging, and diseases. Clin Interv Aging 2018; 13(1): 757772. Feng KF, Chen W, Sun L, Liu J, Zhao Y, Li L, et al. Optimization extraction, preliminary characterization and antioxidant activity in vitro of polysaccharides from Stachys sieboldii Miq. Tubers. Carbohydr Polym 2015; 125(2): 45-52. Khanavi M, Hajimahmoodi M, Cheraghi-Niroomand M, Kargar Z, Ajani Y, Hadjiakhoondi A, et al. Comparison of the antioxidant activity and total phenolic contents in some Stachys species. Afr J Biotechnol 2009; 8(6): 1143-1147. Gaucher C, Boudier A, Bonetti J, Clarot I, Leroy P, Parent M. Glutatjione: Antioxidant properties dedicated to nanotechnologies. Antioxidants 2018; 7(5): 62. Doi: 10.3390/antiox7050062. Abdel-Sattar E, El-Gayed SH, Shehata I, Ashour OH, Nagy AA, Mohamadin AM. Antioxidant and cardioprotective activity of Stachys schimperi Vatke against doxorubicin-induced cardiotoxicity. Bull Faculty Pharmacy Cairo Uni 2012; 50(1): 41-47. Tepe B, Degerli S, Arslan S, Malatyali E, Sarikurkcu C. Determination of chemical profile, antioxidant, DNA damage protection and antiamoebic activities of Teucrium polium and Stachys iberica. Fitoterapia 2011; 82(10): 237-246.